Close to the zenith and easily identifiable is the bright star Spica, which is the alpha star in the constellation Virgo. 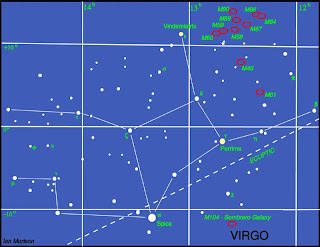 Virgo is one of the constellations of the zodiac. Its name is Latin for virgin,). Lying between Leo to the west and Libra to the east, it is the second largest constellation in the sky. Because of the presence of a galaxy cluster (consequently called the Virgo cluster) within its borders), this constellation is especially rich in galaxies. Illustrated above, some examples are Messier 49 (elliptical), Messier 58 (spiral), Messier 59 (elliptical), Messier 60 (elliptical), Messier 61 (spiral), Messier 84 (lenticular), Messier 86 (lenticular), Messier 87 (elliptical and a famous radio source), Messier 89 (elliptical) and Messier 90 (spiral). A noted galaxy that is not part of the cluster is the Sombrero Galaxy (M104), an unusual spiral galaxy. 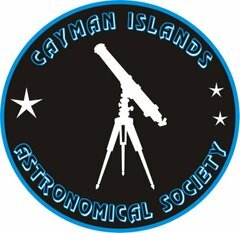 It is located about 10° due west of Spica. Spica (also known as α Vir / α Virginis / Alpha Virginis) is the 15th brightest star in the nighttime sky. It is 260 light years distant from Earth. A blue giant, it is a variable of the Beta Cephei type. Who exactly Virgo was considered to represent is uncertain; in history, it has been associated with nearly every prominent goddess, including Ishtar, Isis, Cybele, and Athena, as well as with Mary the Mother of Jesus. Persephone (who in some mythologies, notably the Eleusinian Mysteries, was considered to be a form of Demeter) is often mentioned as well, Virgo being visible mainly in the spring months when she was believed to have risen from the underworld. According to one interpretation, the constellation depicts Astraea, the virgin daughter of the god Zeus and the goddess Themis. Astraea was known as the goddess of justice, and was identified as this constellation due to the presence of the scales of justice Libra nearby, and supposedly ruled the world at one point with her wise ways until mankind became so callous she returned to the skies disgusted. Saturn is visible as darkness falls, but for the other planets you will either stay up late, to see Jupiter, which rises after 10 pm, or get up before dawn to see Venus and Mars.